Christmas is finally here. Go through this list to get your hands on the coolest gifts of Christmas 2016 for your kids. 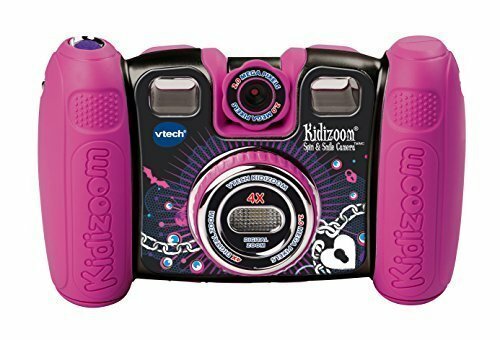 This is Vtech’s spin and smile camera featuring a 2.2 inches TFT colored LCD screen and 2 Megapixel digital camera. It has a twisting lens and a built-in a flash with an excellent voice recording function. The voice recording feature can play five different voice changing effects. It can also make a movie and features stop frame animation. The unit has an impressive 256 MB built-in memory, expandable memory with microSD capacity from 1 GB to 32 GB. It automatically shuts off after 3 minutes of inactivity. Fun and durable, take photos and movies of your friends and self-portraits. “This camera is so much better than the Fisherprice equivalent it replaced. It came with batteries installed (that was a nice touch, VTech!) and the built-in memory holds many, many pictures. My daughter (7) loves it as she figured out all the bells and whistles in just a few minutes. It takes still pictures (2MB), video, and even has a voice recorder. The pictures can be “enhanced” with different cartoon shapes or funny distortion and put into a slide show. This unit also has a little flash (LED light). Picture quality is so-so but adequate, and my daughter has a lot of fun with it nonetheless. After one solid week of using it, taking a hundred+ pictures, viewing, and deleting them, the batteries (4x AA) finally gave out. I will probably add a micro SD card to it so she can keep a bunch on the camera for viewing. The camera also has a USB port and cable for downloading to a computer.” – Amazon’s Customer Review. 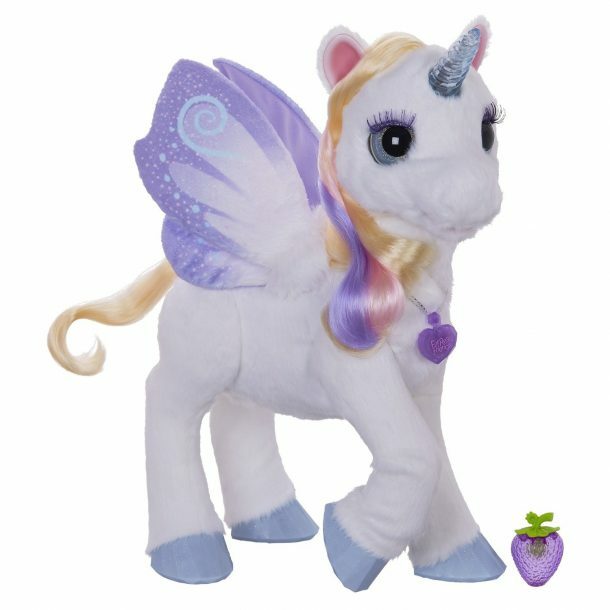 You girls will love this pet unicorn; that responds to touch with lifelike movements. She has a horn that lights up with different colors and can spread and flutter her wings. These cuddly pals can give your child unconditional love, laughter and more. “My granddaughter is 5, and she loved it.” – Amazon’s Customer Review. 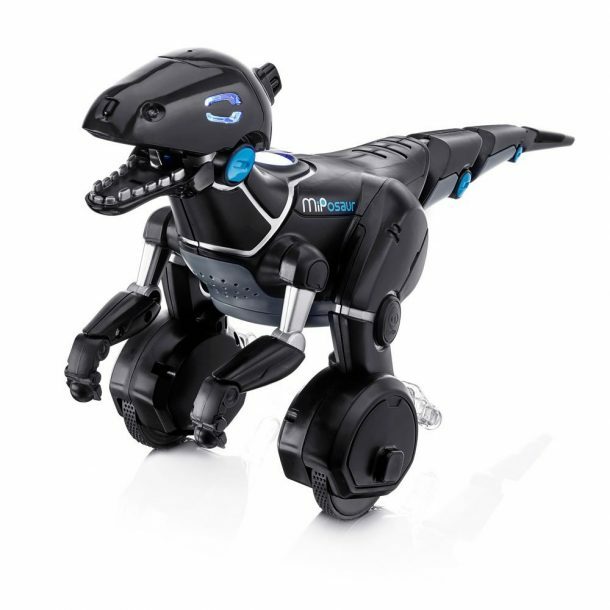 Miposaur comes with beacon-sensing infused trackball which activates modes like dance, feed, the chase for the kids. This intelligent little dinosaur responds to you, hands, trackball, and application. It has three different moods and ten different commands. The trackball features six different game modes. The streets will shake when you take your miposaur for a walk! “I think this is a great toy. I know it’s geared for kids, but it also makes a fun toy for around the office as well. My coworkers were getting a kick out of it, particularly since it wandered around the cubicles and aisle ways. As for navigating around objects, it does not seem to do as well as the MIP robot (which I also have), but still does okay, but does get itself stuck if it turns too late. Perhaps a future version should have more IR sensors which may help. As for hand gestures, it works most of the time, but sometimes it takes multiple tries to get it going. I’m sure with firmware updates; this will continue to get better. The Android app seems to work well, and downloading the app for iPhone or Android is important, since that’s how firmware updates will be delivered to the Miposaur. I’m currently using the miposaur on medium height carpet in my, and it has no problems what so ever navigating, and in the office, we have tiny commercial grade carpet and works well on that too. I’m currently using Lithium batteries, so we’ll see how long those last, but so far after a few hours of use, the batteries are still full (Note: The four lithium batteries will maintain approx. 6 volts right up until they go bad, so a full battery can be a dead battery within seconds once their life is up). Overall I’m happy with this toy and would recommend it, but as with anything new on the market, there are a few minor bugs that will hopefully be worked out with software updates.” – Amazon’s Customer Review. It’s fair to the parents when they can’t let the kids use the high-tech cameras. But, hey kids! Check this out. Your very own, personal action camera which you can take skateboarding, cycling, swimming and where not. 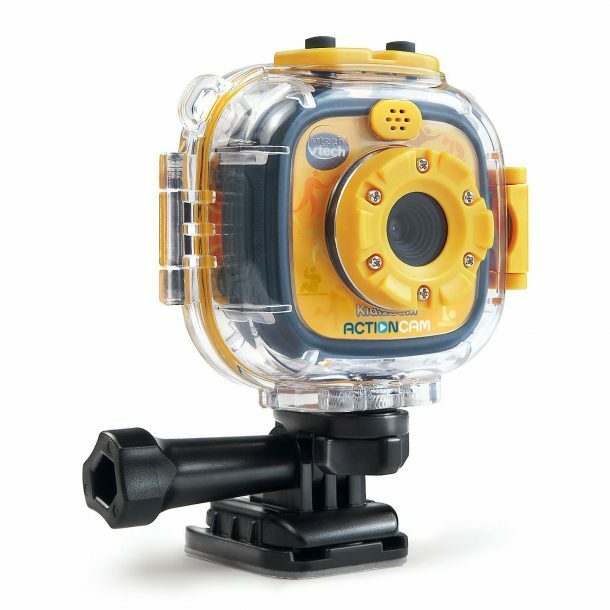 It features a 1.4-inch color video camera LCD screen and the ability to take videos, photos, stop-motion videos and time-lapse photos. It also comes with fun photo effects, frames, and filters and is rechargeable. Best for ages 4 to 9 years. “While this isn’t a perfect action camera by far, this is the ideal action camera for kids. It’s easy to use. You can take it virtually anywhere: in the air, underwater, you name it. It floats, and it’s just about indestructible. My family took it to a hotel with a swimming pool and a water park to test it out. My husband and I used it to make sure we put it through its paces, and it came through no matter what we did to it. The video included here was shot with this camera. As you can see, we took into a swimming pool and the water. We threw it up in the air. When it landed in the water, it floated, making it easy to retrieve. We took it down a water slide. We even filmed a hot tub–underwater. We also gave it to our daughter, and her footage came out great. (The only reason why we haven’t included it is that she recorded kids she met, including one kid who did a great job hamming it up under water, but we didn’t want to post photos of children without their parents’ permission.) Every time my daughter filmed, kids came up to her and asked her what she is doing. When she told them she was filming them, they all said, “Cool!” Some kids asked for and were given a go. You know a toy is a good toy when every child wants to play with it.” – Amazon’s Customer Review. A musical rhyming book for toddlers with big easy to turn pages; this is an interactive nursery rhyme book which comes with six classic nursery rhymes. It has five colorful piano buttons that make sounds and introduce to different instruments. A great early learning toy for toddlers and babies. “My one-year-old daughter loves this book! The inside is interactive with buttons that slide to make sounds or play music. The five buttons sticking out the side with musical instruments can be used as a mini piano when the book is closed. My baby loves music, and this has quickly become one of her favourite toys. We will be flying from coast to coast this summer, and I know that this is one of the few toys we will be taking on the plane. It keeps her busy and entertained, and it has a volume control, so I can turn down the sounds to not disturb the other passengers. It encourages reading readiness and brain growth through rhymes and music. The book is colourful and made to withstand the rough play of toddlers. It came ready to use, no assembly or batteries required, which is ideal for busy parents.” – Amazon’s Customer Review. The greatest past time game I must say. Made more exciting by the electronic card dispenser. The shooter acts as a storage unit and is portable. “We played this last night as a family, group of 4 adults and three kids ages from 6 to 77 and I am guessing they will want to play again tonight. HAD A BLAST… BUY THIS GAME. You will not be disappointed! When the cards shoot out, everyone laughs, and it’s just so much fun! 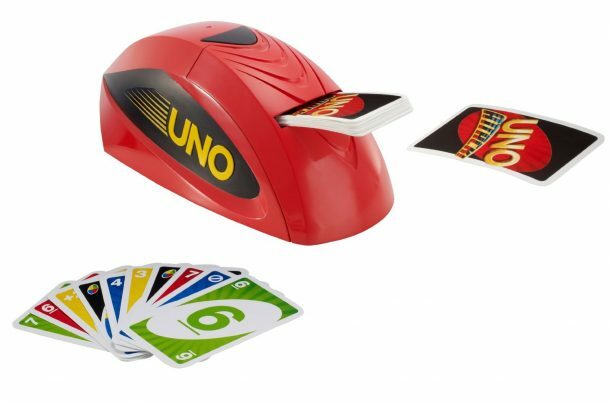 A super fun spin on the original (which we love playing, too)” – Amazon’s Customer Review. 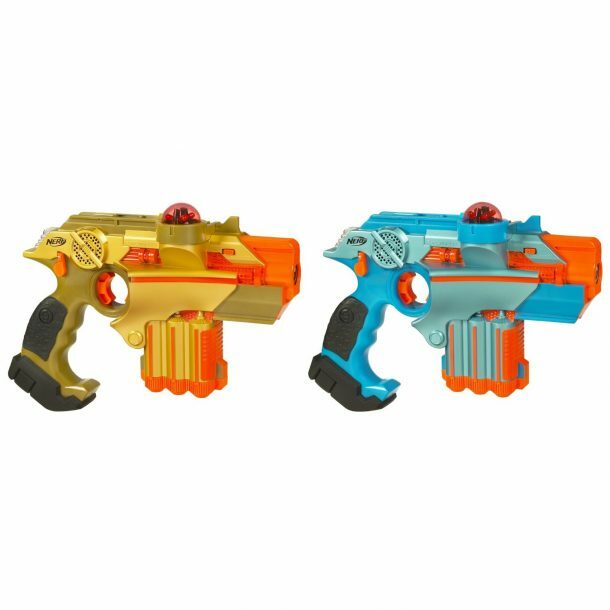 A great set of laser guns that let you play all sorts and battle in a field like no one has ever done. Taggers register hits with lights, sounds, and vibrations. “One of the best toys ever!! No bullets to lose. Nothing left in the yard. Nothing to knock over breakables in the house. Inside or outside they are fun for the whole family. The range outdoors is at least 100 ft. We play on 3 acres, and they seem to work. If you don’t use the sights, you won’t hit anything at that range, but when you do you get a hit. There is a setting that selects how many times you can be hit before you are out of the game. This allows you to give an advantage to younger players (or disadvantage dad). You can play in teams, or every person for themselves. We have had our first set for five years. We just bought a second set to allow four players at once. Battery life is six months or more with moderate usage. We don’t purchase a lot of plastic toys. Most are junk. This one is not. If you have kids between 5 and 14yrs, I would highly recommend.” – Amazon’s Customer Review. This is a drum set for the toddlers and kids allowing them to play three drum pads and a cymbal each of which makes its unique sound for sensory development. 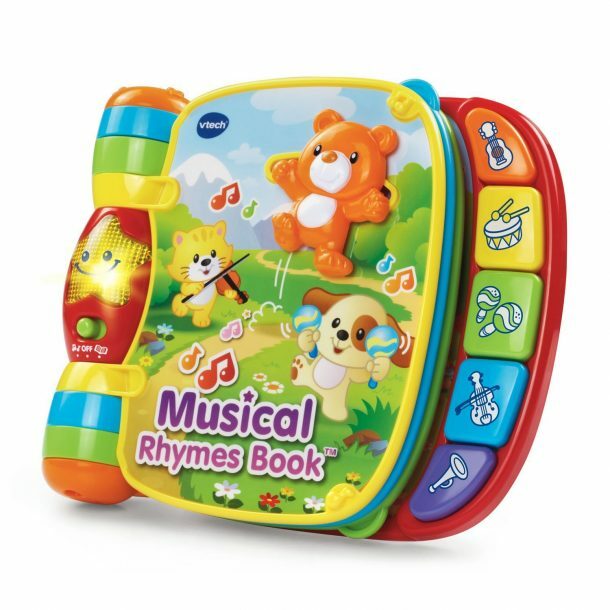 They can play up to 9 melodies including numbers, letters, and music. It has four modes of play: free play, letters, numbers, and follow-along. 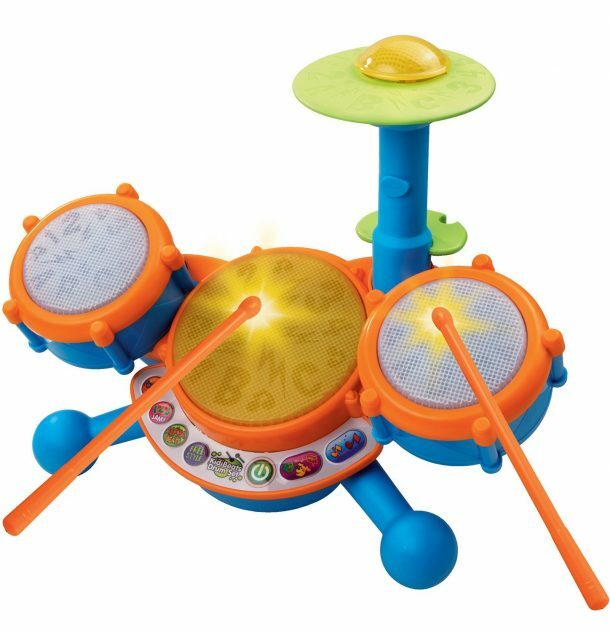 Allows your child to feel like the drummer does! “I’m a nanny and the little boy I watch just received this for his birthday. He’s only one, so he doesn’t quite get the concept of it yet, but he’s enjoyed it as much as he can. I’m writing the review b/c I see people complaining about the settings it has or “doesn’t” have… There IS a way just to freestyle; there’s a specific button for it that says “freestyle”. Also, there’s a button on the right that lets you turn the background songs off..they actually don’t have to be continually played. I suppose these adults who are complaining about those things just aren’t tech savvy enough to figure out this toy..(apparently they don’t know how to push little buttons with specific words and or symbols)” – Amazon’s Customer Review. This is a Star Wars application controlled robot which listens, responds and reacts to your voice. You can record and view virtual holographic videos and the boy also has a mind of its own. 1. The design – Some Star Wars desktop statues can go for a much higher cost than this, but this apparently allows you to do so much more than just displaying it on your desktop. 2. The packaging – simple and secure packaging in a beautiful design. It’s Disney + Star Wars. Easy to start playing with it out of the box. 3. The accessories – I prefer a USB cable over another AC adapter. The cradle is detailed and provides a secure and clean charging platform for BB-8. The magnetic BB-8 head has wheels to help rotate 360 degrees. 4. The interactivity – The downloadable app allows you to control BB-8 directly, listen to the cool sounds of BB-8, has a camera to record augmented reality messages and listens to voice commands. Surely will be upgraded in the future with more! It’s super fun to direct and control BB-8 around your home for your friends, family, pets and other BB-8s! The charger and the BB-8 unit have lights to indicate charging or when BB-8 is expressive. See the photos I’ve included for more details. 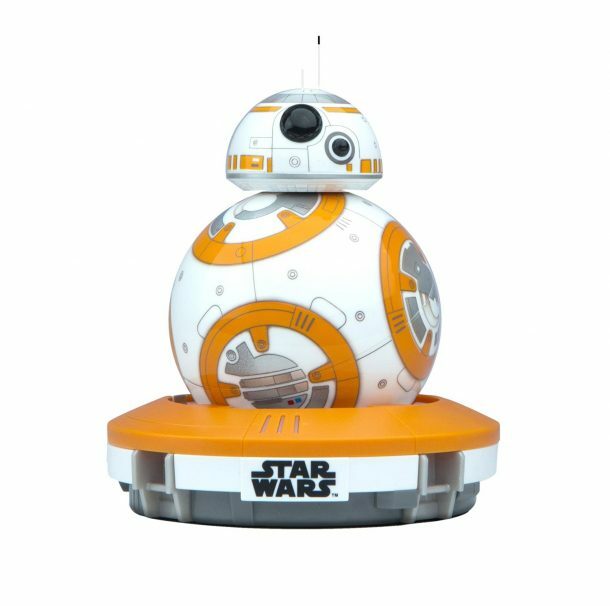 The $149.99 MSRP may be restrictive to some, but if you have some money that you can put into having one piece of Star Wars Episode VII memorabilia, the Sphero BB-8 is something significant to consider. I had no problems with operation. Enjoyable and to me, worth it!” – Amazon’s Customer Review. 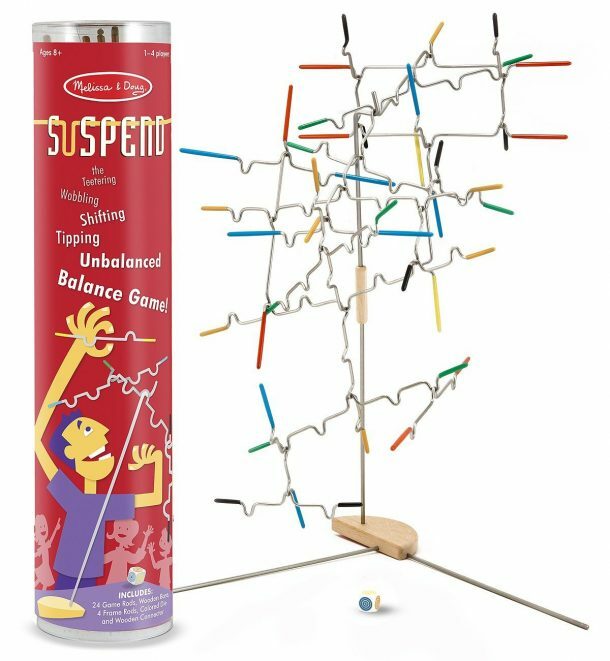 An exciting game of balance for 1-4 players and includes 24 rods, wooden base, four frame rods, colored die and wooden connector. Develops hand-eye coordination, cognitive skills, and interpersonal skills. “A great, engaging game for (most) ages. This can be played cooperatively (let’s see whether we can hang all of the pieces working together) or competitively (who will successfully attach all their pieces first?). And after you have all of the pieces hung, it’s just as much fun to see if you can remove them one at a time without disrupting the entire sculpture. While it’s recommended for 8 and up, a 3-year-old was able to hang pieces with a lot of help. Nevertheless, it’s challenging – and whimsical enough – keeping teens and adults engaged as well. Patience, concentration, a steady hand, and a little creativity are all key. One minor critique – the packaging isn’t very strong, and this is such a weird shaped bundle of pieces, you need some container to store it in. Also, a wish – it would be great if they would come out with an extension pack with more odd shapes.” – Amazon’s Customer Review.